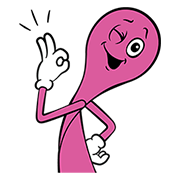 http://www.line-stickers.com/ – Pinky the Spoon Line Sticker | For a limited time only, introducing Baskin-Robbins’ brand-new character, Pinky the Spoon! Friend Baskin-Robbins’ official account to get the set for free. Available till July 5, 2017. If Not You, Then Who! ?